Real flying bugs that hover in the air for you to shoot down! Motorized launcher that works by pressing its button down with your foot so you have your hands free to shot down the bugs! Release the pedal and watch your bugs fly through the air and take them down before they land! The Swarm-Seeker is specially tailored for quick fire with its 10 dart capacity magazine so you'll have plenty of shots to hit your targets! 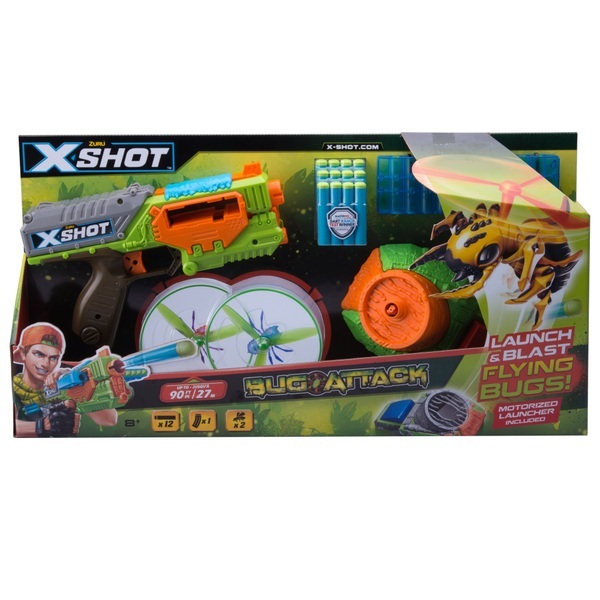 X-Shot Bug Attack Flying Bugs is here! Take down REAL flying targets by placing your bugs onto the motorized launcher, pressing its pedal down with your foot and releasing it shortly after and see your bugs soar in the air as you try and take them down before they land! This pack also features the exclusive Swarm-Seeker, a rapid fire blaster that can shoot 10 darts in no time!